Overview - Made for speed and hi-def: the revved-up 3-time Oscar® winner! Formula I drivers compete to be the best in this slam-you-into-the-driver’s seat tale of speed, spectacle and intertwined personal lives. John Frankenheimer (who 32 years later would again stomp the pedal to the metal for the car chases of Ronin) directs this winner of 3 Academy Awards,* crafting split-screen images to capture the overlapping drama and orchestrating you-are-there POV camerawork to intensify the hard-driving thrills. Nearly 30 top drivers take part in the excitement. Buckle up to race with the best. Over the years, many movies have attempted to literally place the viewer within the action sequences of a story, giving them a comparable sense of motion and atmosphere to what the characters are experiencing themselves. Car chases and racing scenes in particular tend to be a recurring candidate for this method. Through editing techniques, compositions, and camera movement, filmmakers endeavor to forge a truly visceral experience that engenders a real, palpable sense of speed and excitement. While many of these efforts have succeeded to varying degrees, perhaps none have risen to the challenge quite as bravely or effectively as director John Frankenheimer's 1966 racing epic 'Grand Prix'. Hot off the success of such classics as 'The Manchurian Candidate' and 'Seven Days in May', Frankenheimer combined his love of Formula One racing with his knack for cinematic ingenuity to create an innovative technical marvel that to this day remains one of the most artful examinations of the fast paced, high stakes world of professional racing. The story of 'Grand Prix' revolves around the lives of four Formula One competitors, Pete Aron (James Garner), Jean-Pierre Sarti (Yves Montand), Scott Stoddard (Brian Bedford), and Nino Barlini (Antonio Sabato), as they battle it out in a series of perilous races and juggle their complicated romantic relationships outside the circuit. With a cast rounded out by the lovely Eva Marie Saint, Francoise Hardy, and Jessica Walter (yes, Lucille Bluth herself), the performances are all great. Garner brings the right level of cocky confidence and honorable sportsmanship to his role and Yves Montand lends a bittersweet facet to an aging racer who longs for a quiet life but just can't seem to let the track go. In fact, while certainly an ensemble piece, Montand really cements himself as the heart and soul of the film and his scenes with Saint carry the most emotional weight. The script also draws some rich thematic elements that evoke parallels between the dangerous thrills of the race and the emotional dangers of the character's personal lives. There is an inherent madness to these men, an unquenchable thirst for speed that keeps drawing them back, even in the face of potential death, and the screenplay does a fairly good job capturing that, to sometimes tragic result. While this all adds up to a reasonably well written story, there's no arguing that the real star here is the amazing and quite groundbreaking cinematography. 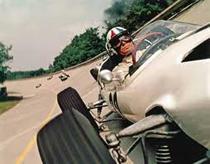 Originally shot for Cinerama screens, 'Grand Prix' is a filmic treasure of style and technical marvel. The opening main titles sequence, designed in part by the great Saul Bass, sets the stage for the powerful visual presentation that follows. Split screen is used effectively to provide multiple angles of the races simultaneously or provide subtly different variations of shots in an artful mosaic. Long lenses give a great sense of speed and camera angles are covered from just about every conceivable vantage point, giving the audience everything from wide, bird's-eye views to racer POVs strapped right into the car. Each choice of angle, movement, and cut is all done with the intention of thrusting us directly into the action in ways few films have ever dared to try. Sound design is also a marvel, at times weaving a rhythmic score of effects through metal parts clanking, engines roaring, and tires squealing. Voice over is used to overlay interviews with racers as they zoom around the course, providing us with important background information and insight without breaking the flow of action. In sharp contrast to these quick cutting, intense, highly stylized race sequences, are the scenes that take place off the track. Here, Frankenheimer adheres to a more traditional and elegant form, with deliberate and ornate compositions, lingering master shots, and a more methodical pace, focusing on the characters and their emotional journeys. The race at the climax of the movie serves to bridge these two styles and incorporates all of the technical tricks used throughout in a wonderful marriage of split screen and voice over which sees scenes of the racers off the track literally play right alongside them as they rocket down sharp corners and hair raising turns. While there's no denying the visual excellence on display here, there are indeed some stumbles in the narrative's execution. At nearly three hours in length, the film's main enemy is its pacing. Though beautifully shot, the extended racing sequences can drag a bit at times, occasionally overstaying their welcome. Likewise, some of the relationship drama takes a bit too long to find its footing and can border on the melodramatic and underdeveloped. Even with the epic run time, some characters, especially the Italian racer Barlini, aren't given much to do and don't really have significant arcs. While the script does offer some insight into the fascinating psychology of these racers and the life threatening decisions they make, it doesn't go quite deep enough. Still, it's clear that story wasn't the full focus here, and the charm of the talent involved, some key emotional scenes and dialogue, and the aforementioned visual ingenuity, help elevate and carry us through the more banal elements and bolster the overall experience. I've never been in a Formula One car, and really to be honest rarely break the speed limit, but 'Grand Prix' has given me a small taste of what it must feel like to charge across a finish line at incredible pace. From a cinematic standpoint, the level of visceral momentum that Frankenheimer was able to create, and the amazing angles he was able to capture, are nothing short of extraordinary. While the story is a bit on the slow and traditional side, if you can get beyond its sometimes ponderous length, there's a lot to admire here. It may not come in first or even second, but 'Grand Prix' is a worthy competitor. Presented in a 1080p/AVC transfer in the 2.20:1 aspect ratio, 'Grand Prix' looks quite stunning on Blu-ray. Taken from the original 65mm elements this is a very strong transfer. The first few shots of the film, featuring close-ups of various drivers, crew, and vehicles, all gearing up for the start of a race, aren't terribly impressive and had me worried that the transfer might not do justice to the strong visuals that this film is known for. Thankfully, as soon as we cut away from these establishing shots and move to our first wide look at the racetrack, things immediately take a remarkable turn. From then on out, detail is great and depth is at times remarkable. The various racing sequences pulsate with speed, energy, and clarity, pulling the viewer right into the action. Likewise, the video outside the racetrack is equally fantastic showing off the film's elegant compositions with technical precision. Contrast is good and black levels are deep and inky with nice shadow detail. Colors are rich and vibrant and the wonderful 1960s palette pops off the screen. The only real downside to the transfer is some minor areas of damage to the source. Though mostly clean and pristine, there are occasional specks, signs of dirt, and vertical lines. These tend to crop up more during the racing footage, but really don't take away much from the otherwise flawless presentation. Overall, 'Grand Prix' is a beautiful looking Blu-ray. Warner has done a great job transferring the 65mm widescreen film elements without overdoing digital processing, preserving the integrity of the original source. Though there are some minor signs of age in a few shots, by and large this is a spectacular video presentation. 'Grand Prix' is provided with an English DTS-HD Master Audio 5.1 track, a French, German, and Portuguese Dolby Digital Mono track, and a Spanish Dolby Digital 5.1 track with English SDH, French, German, Spanish, Castilian, Portuguese, Danish, Finnish, Norwegian, and Swedish subtitle options. Though labeled a 5.1 track, there is a disappointing lack of surround activity. While there are some engine roars and squealing effects sent to the rears in the racing scenes they never really add up to a very enveloping experience. With that said, there's some nice directionality between the three front speakers. Dialogue is clean and free of any hissing or distortion but can sound a bit thin. Dynamic range is decent and bass does bring some power in the racing scenes but neither come anywhere near the wide gamut or thunderous punch of contemporary tracks. 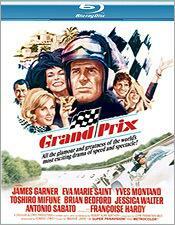 Overall, 'Grand Prix' sounds pretty good for a film of this age. While never overly impressive, it suits the movie well and delivers a respectful experience. Warner Bros. has included a decent amount of supplements taking the shape of five featurettes and a theatrical trailer. All of the featurettes are provided in standard definition with stereo sound and English, French, Spanish, Castilian, German, Portuguese, Danish, Finnish, Norwegian, and Swedish subtitle options. Pushing the Limit: The Making of Grand Prix (SD, 29 min) - This is a fairly interesting look at the making of the film featuring recent and archival interviews with cast and crew as well as behind the scenes footage. 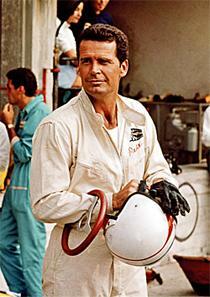 Some areas of interest covered include the difficulty of securing the Formula One community's support, the technical ingenuity that led to some of the impressive race footage, discussion on Frankenheimer's sometimes difficult directing methods, and the fact that Steve McQueen was the original choice for James Garner's character. Another highlight includes a brief story Garner tells about an altercation he got into with a local shop owner who was disrupting shooting. You hear actors tell stories like this all the time in interviews and sometimes question how much is actually true, but here they actually show the footage to back it up. While not the most comprehensive making of feature, this is much better than your average press kit fluff piece found on many Blu-rays. Flat Out: Formula 1 in the Sixties (SD, 17 min) - This is a detailed look at Formula One racing in the sixties, featuring interviews with drivers and experts along with archival footage. The participants go into the evolution of the sport, the exciting lifestyle, and extreme dangers due to a lack of safety procedures at the time. Overall, this is a decent feature that provides some nice history on the sport which inspired the movie. The Style and Sound of Speed (SD, 12 min) - This feature goes into the visual look and sound design of the film. Topics touched upon include Saul Bass' contributions to the look and editing style of the movie, the attention to detail paid to the sound mixing, the different looks of the various race sequences, and the Cinerama process. While a bit brief, it is informative and worth a look. Brands Hatch: Behind the Checkered Flag (SD, 11 min) - This is a close look at the famous Brands Hatch racing circuit located in England that was featured in the movie. Experts guide us through the track and explain what makes its curves and turns so unique and challenging. This is probably really only of interest to racing enthusiasts. Grand Prix: Challenge of the Champions (SD, 13 min) - This is a wonderfully vintage behind the scenes documentary taken during the making of the movie that focuses on the opening sequence in Monaco. Trailers (SD) - The film's theatrical trailer and a pointless promo for the Speed Channel are presented here. In the end, 'Grand Prix' is a technically impressive and visually thrilling ensemble film about racers, their sport, and their loves. While it could have used a few trims in the editing room and bit more substance beneath its winding circuit of romantic storylines, it's still a well crafted piece of filmmaking. The video here is truly impressive, the audio is good, and the supplements offer some nice insights and background information. Overall, a good disc that gets my recommendation.